The NHS Screening Programmes have their own way of making sure everything “doesn’t happen at once”. 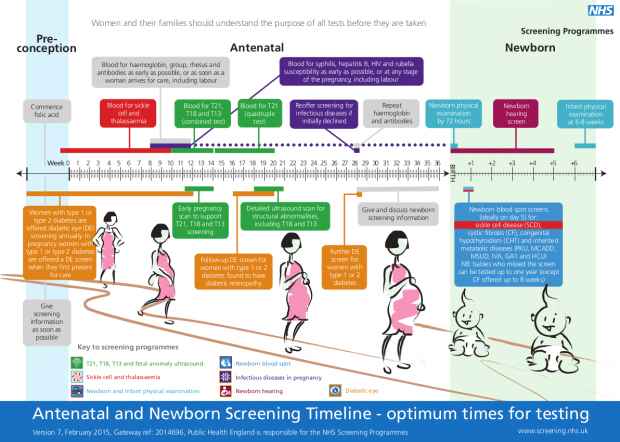 We have the antenatal and newborn screening timeline which (below and available on our CPD website as a PDF) outlines when all our antenatal and newborn screening tests should be done. It’s one of our most popular non-elearning resources. We always bring lots of hard copies to conferences but, try as we might, we constantly run out before the conference is over! We seem to have a knack of underestimating the popularity of this particular resource. Maybe it’s because it’s all there in one place and a good reminder of what should happen when, all represented in a wonderful graphic. Clearly people find it very useful, if you don’t already I’m sure you will too. We’ve also produced a really nice animated version of the timeline. It features a woman who starts walking along, becomes pregnant, and then – hey presto – a little baby pops up when the screening tests change from antenatal to newborn. As in the printed copy, all the tests appear at the appropriate point along the timeline. It's less than four minutes long so just click on the screen shot below and see what you think.